EING THE FIFTH contributor to this series is no easy task, as so many excellent ideas have been proffered by the bloggers who have preceded me. I do not envy the task of Jeff & Aurelio, whose thoughts are still to come tomorrow & the next day. For my part, today, I will add two small ideas to the many more important thoughts already shared. IRST, an important early step toward promoting good music at your parish would be to promote silence in your liturgies. Silence is one of the most important sounds of the liturgy. Anyone who lives in a home with other people knows that silence is an asset that must be fostered if it is not to be forgotten. There is a beauty to silence that cannot be ignored; it possesses its own noble role, a sort of a priori legitimacy that deserves a fair hearing. • End your prelude a minute or two early, so that the Mass is immediately preceded by an atmosphere of silence. • Train your lectors & psalmists to pause between readings. A solid, 20-second pause sends a message to the congregation that invites them to enter into meditation on the Word of God. • Talk with your priest about observing the silent pauses called for during the Act of Penitence and after each Oremus. • Encourage your priest to sit down briefly after his homily, rather than bursting right into the Creed. • Once the tabernacle door closes after Communion, consider forgoing your usual organ instrumental in favor of complete silence. There are other potential moments for silence, too, but inserting or expanding the silence in these places would go a long way toward reclaiming the sacredness of both silence and sound. ECOND, encourage your priest to do his part. (Okay, this point has already been made within this series by my fellow bloggers, but I hope to bring something extra to the point as a priest, myself.) Even if you must continue for a time with the four-hymn sandwich (an undesirable, but sometimes inexorable state of affairs), simply having the priest chant the dialogues can still give the liturgy a distinctly sacral tone. A Mass in which all the dialogues are chanted and four hymns are sung would be a vast improvement over the status quo in many places. Once the dialogues are in place, it will be easier to start stripping away the hymns, because they will start to appear as extraneous as they are. 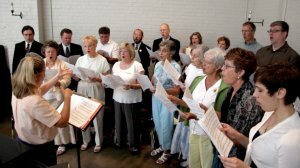 Cultivating silence and singing the dialogues are two simple, practical, and essential steps towards improving music at your parish.